Dave and Kim Charlebois visit Dave’s spine surgeon, Dr. Mike Janssen, on December 7, the day after Dave’s surgery for a herniated disc. Dave was walking the same day of surgery and pain-free by the next morning. The accident happened a month before Dave and wife Kim’s upcoming international snowmobile adventure in Saratoga, WY. The couple, who live in Les Coteaux, Quebec, went anyway. During the weekend, Dave’s pain grew worse. On the first day, he hit his left leg on a rock while snowmobiling. It hurt, but he took a few pills and kept on going. “At the end of the day, I’d go lay in the Saratoga Hot Springs, and it would feel better, but then it got worse again. Kim had to pull up my boots when we went snowmobiling.” By the time the two reached Laramie after leaving Saratoga and heading home, Dave could not get out of the car without Kim’s help. Fortunately, Dave knew Dr. Michael Janssen, a spine surgeon at the Center for Spine and Orthopedics. The two became friends after meeting at a speedboat race years earlier. 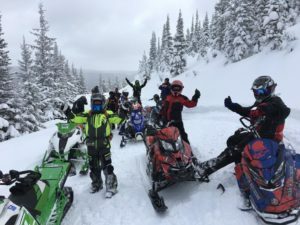 Dave Charlebois (R) enjoys snowmobiling with his wife, Kim (center). The couple’s latest snowmobile tour was led by Dr. Janssen (L) out of his Saratoga Hot Springs Resort in Saratoga, WY. 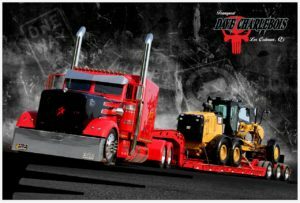 As a professional trucker who hauls heavy equipment, Dave often spends 10 or more hours in his truck at a time, which can be hard on his back. After falling from his roof while clearing snow, Dave began experiencing chronic low back pain. Dave and Kim returned to their hotel, and he walked that day for 15 minutes at a time. After walking, he applied ice, rested for 30 minutes and then walked again. “The next morning, his pain was gone. “Since earlier this year, I have always had chronic back pain, but Thursday morning, it was gone,” he says. He went to see Dr. Janssen for a follow up visit that afternoon. “Dr. Janssen explained some restrictions. He told me ‘no snowmobiling for a year’ as he knows how I ride with only two hands on the bars,” says Dave with a laugh. The couple would have booked a flight home on Thursday if they’d known how good Dave would feel. Instead, at the end of Dave’s follow-up visit, Dr. Janssen invited them to join in the Center for Spine and Orthopedics’ “Roaring 20’s Casino Night” Christmas party that night, which they did. They fit right in with their new friends at the center, enjoying great food and fun, playing blackjack and poker with fake chips. 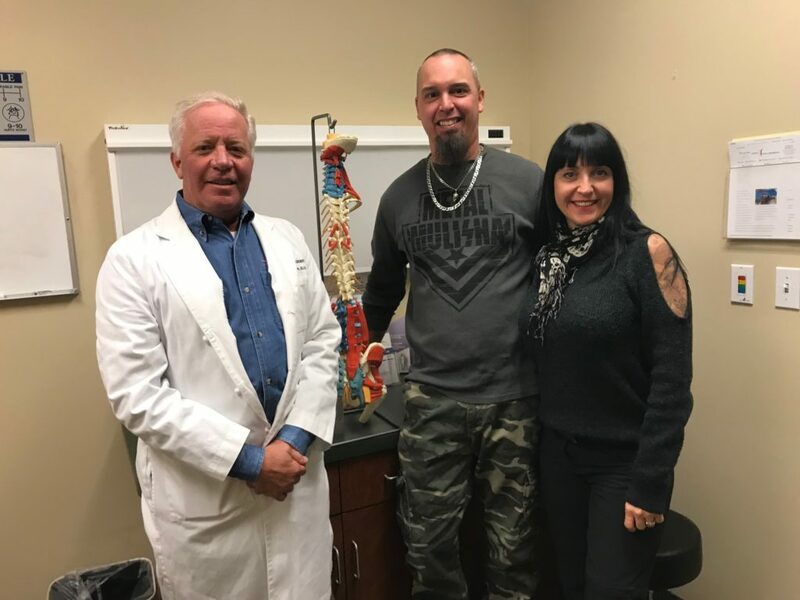 Dave and his wife, Kim, who live in Quebec traveled to Denver for spine surgery by Dr. Janssen of the Center for Spine and Orthopedics. On Saturday morning, the two then flew back to Montreal where they spent the holidays and started getting back to the activities they love. “The most important satisfaction in life is helping others like Dave overcome physical setbacks and return to work and the activities they enjoy pain-free,” says Dr. Janssen. If you would like for Dr. Janssen to review your MRI, the cost is $500 and can be arranged by calling the Center for Spine and Orthopedics at 303-287-2800. Dr. Janssen does require a recent MRI (within the past six months). As an alternative, you can schedule an appointment with Dr. Janssen, in which case, there would be no charge to review your MRI, and your visit would be billed to your insurance. Due to the large volume of requests, we are currently exploring telemedicine as an option, but that is not yet available.